Super Dust Deputy DIY conversion or Oneida Mini Gorilla? 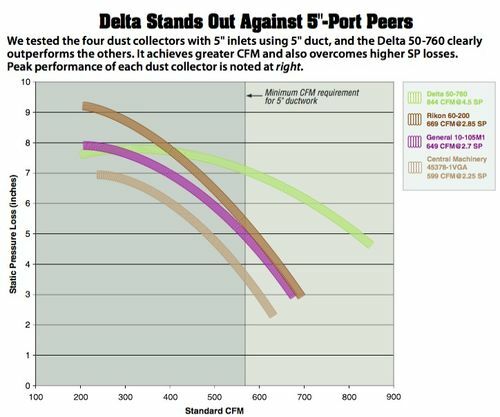 Looking to upgrade my dust collection from my existing Delta 50-760 single stage unit. My preferred options are to either fit the Delta out with a Super Dust Deputy cyclone & Wynn NANO Filter, or replace with an Oneida Mini Gorilla. My question goes to the actual performance of these two options, or more generally, a comparison between a single stage converted to use a cyclone vs the Mini Gorilla. 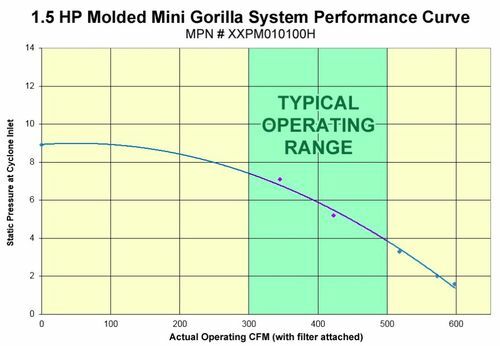 The Mini Gorilla does cost more, and if it delivers superior performance, I’m okay with that. I am limited in this application to 120v power, and require HEPA filtration, both options satisfy those requirements. 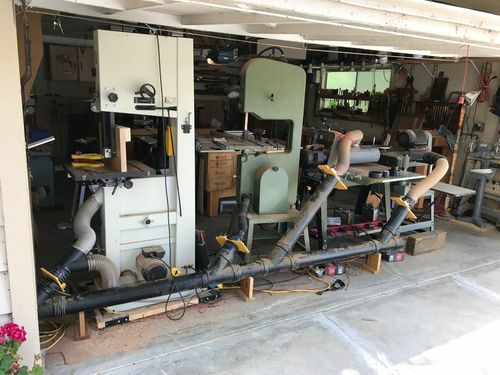 The DC will remain mobile, machines to be serviced include a 3hp tablesaw, a 24” bandsaw, and a 12” jointer-planer as well as a Supermax 19-38 in the future. I cannot speak about the gorilla, but I did a Wynn filter with a Thein separator on my delta unit. The cost factor prevented me from being able to get a different DC unit. I am pleased with the results I got based on expenditure or Return On Investment. My change did result in capturing the really fine dust the unit did not get before. The separater does a great job as the bag never gets much more than a cup full of dust in it unless I forget to empty the bin. 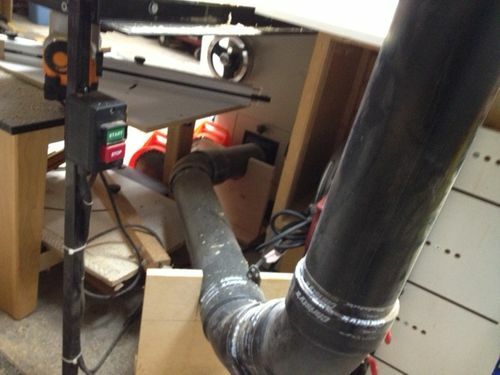 But air volume or velocity was reduced enough that with all my machines I ended up having to add a dedicated (used) DC unit for my jointer and planer. These machines don’t make much in fine dust anyway. If money was no object, then I would have gone to a bigger, better overall DC unit. i bought the ebay seller cyclone . it vents outside . seems to be very effecient . except when my barrel fills nothing seems to go outside . i have one on a 1 1/2hp and another on the 1hp dc. also actually got the one they sell for use with vacuums . so guess i am a big fan on paying less . This is what I did. I have three runs of 15 ft, 20 ft and 25 ft to a 19- 38 drum sander, 15” thickness planner, two big bans saws a cabinet saw and 8” jointer. Works well. Ken -How big is that DC ,how many HP ?? Thanks, that’s exactly the sort of answer I’m looking for, at least as far as covering half the equation goes. If you’re able to pull without any problems from your 15” planer, I should have few/no problems with my 12”, especially since I should get improved CFM by switching to a Wynn filter over the current stock 1 micron bag. It sounds like the “inexpensive” option may be sufficient, which is good news. I have the original Mini-Gorilla (metal yellow cyclone)—the new design looks even nicer than mine. I use it with a contractor’s saw, 6” jointer, 14” bandsaw, 12” planer, and a 19-38. 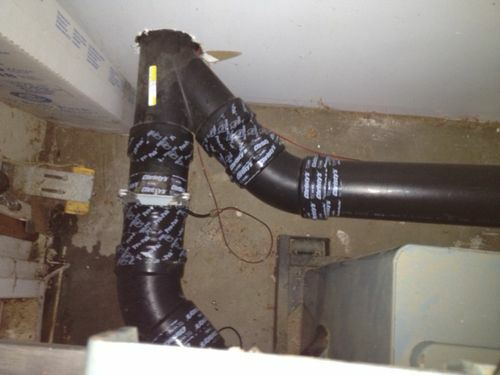 I don’t have any ducting—I just move the 10’ hose from machine to machine. In my opinion it does a good job of clearing the chips/dust from all of these machines. I’m sure it’s not capturing ALL of the fine dust and my workshop dust situation probably would likely not meet OSHA standards—but it serves my needs. 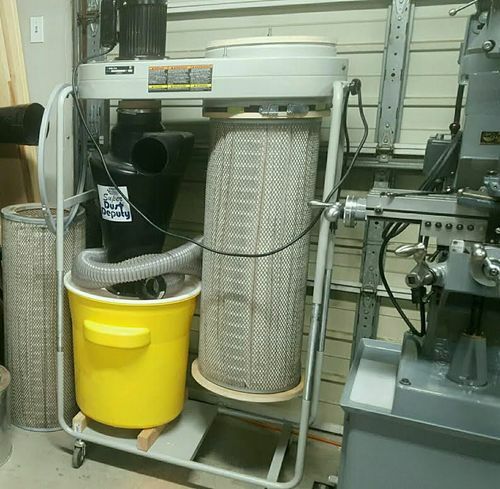 If you get this collector just make sure you check the bin from time to time or it might fill up and then start filling your filter with larger chips/dust—I made this mistake once. I just ‘downgraded’ from a 3.5HP full size cyclone to a Delta 50-760 w/ a SDD & Nano Filter. I looked for a 50-760 specifically because the fan curves for that machine seem to be best in class, and that’s with the stock felt bag. With a canister filter with large surface area it gets better. 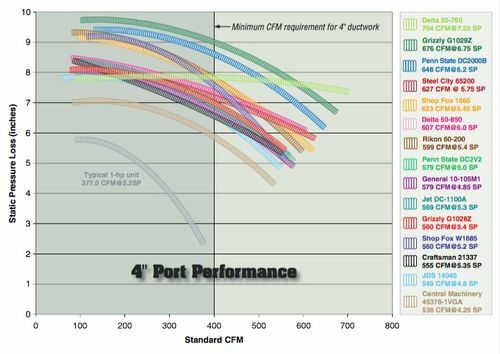 The first thing you need to do is calculate the static pressure loss of your system. There are calculators all over that will help you with this. I personally only use 10’ of 5” hose. Flex hose has like 3x the SPL of a smooth pipe but I had to do it for my situation. Keep in mind that the SDD will add ~2” of SP loss, so factor that in. You can’t run 6” pipe with this dust collector. I mean, I suppose you could but your air velocity is going to drop too low. Stick to 5” max for this size unit. I would not consider ducting a unit this small. Run the numbers though, depending on your situation you might might be able to depending on your runs/splits. You’ll notice that the rotation of the air coming into the SDD is opposite of the impeller rotation on the dust collector. You’ll want to make an air straightener to reduce turbulence of the air as it transitions. I measured the dB level with and without it and the air straightener lowered my dB rating by 2-3db. I’ve had Wynn fiilters in the past but I went with a PSI 14”x36” NANO filter (Merv 15) for ~$180. It has greater surface area at 350sq ft. and fits well. The filter is US made by Clarcor. Josephf, I have a Delta 50-760, I think it’s 1.5hp. Bikerdad, I’m using 4” black pipe. I connected the DC to the SDD with a modified HVAC metal reducer I had, don’t remember where I got it. I don’t know what to say about impeller direction except that I flipped over the unit upside down (space considerations) and it works fine. As you might be able to see the DC is in an adjoining garage so noise isn’t a consideration. I get so little dust in the plastic bag I’m considering the addition of a second filter to replace the bag when I add my stand alone router table to the system. Although I don’t expect to need it. I ve had Wynn fiilters in the past but I went with a PSI 14”x36” NANO filter (Merv 15) for ~$180. It has greater surface area at 350sq ft. and fits well. The filter is US made by Clarcor. Don t be tempted by the Thein Baffle/Tophat. It costs too much in airflow. The SDD is about as efficient as you can get at this scale. No intention of going with a Thein baffle. 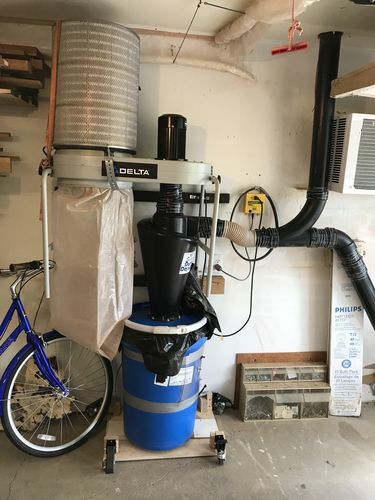 I just ordered the 35 gallon drum, lid and reducer/connector from Oneida. I’m going to pick up the Super Dust Deputy from Woodcraft, saves me $30 in shipping costs. It seems as though the PSI filter you have doesn’t have any ends. Is that why your’s appears to have a plywood disk, to seal the end? If so, how have you attached the disk? Right now, trying to decide between the Wynn and PSI. I’m thinking that they’re pretty similar material, so the main difference is just size. The PSI is longer, thus the higher area. GBW – can you write up/show how you attached the filter to the DC? I have a 50-760 and am going to replace the bag with a canister filter this spring. GBW I’m interested in how you attached your PSI 14”x36” NANO filter as well.